FOUR Swiss chefs have found themselves on the front pages of their nation's newspapers, simply because they cooked a meat pie in the lead-up to Christmas. And obviously not just any meat pie. Because just like we'd do at home, their's had a pastry base filled with meat and other goodies (in this case beef and pork, bacon, garlic, onion and red wine, ) and on coming out of the oven sported a topping of crispy pastry all nicely folded and tucked to save any dribbling and spilling. 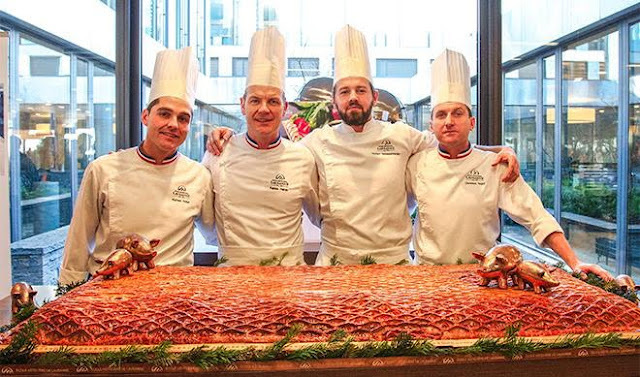 All big enough to put the pie's makers, from the Swiss hotel management school Ecole Hoteliere de Lausanne, in the books of the World Record Academy for the world's largest-ever traditionally one-piece meat pie. After a day to assemble and 40 hours to bake, the massive pie was put on public showing – and then cut up and given away to charities for the needy and homeless at Christmas.